Every year Bryan and I try to see multiple family members during Christmas. We usually switch off who we go see on Christmas day. This year we went up to see Bryan’s mom and siblings in Crestline. 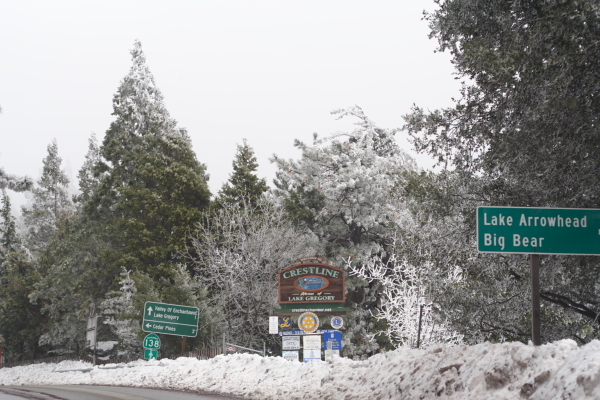 Crestline is a mountain community just near Big Bear and Lake Arrowhead. As most of you Southern Californians know we recently had a big winter storm come through in the last week and that dumped a ton of snow in our mountains. We decided to drive up the afternoon of Christmas Eve, we heard another storm was coming through and we wanted to drive up before it got to us. On the drive up the weather was perfect but cold. We watched as our in car thermometer dropped as we went up the mountain; 50…45…38 degrees! That’s cold for us here in SoCal. 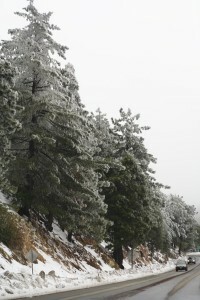 The scenery was beautiful; snowy hilltops with snow flocked trees. The already narrow mountain roads were made even narrower by the berms of snow created by the snow plows. When we got up to the house we were lucky to find the very steep driveway already dug out. It was a shock getting out of the car, I had three layers on and I was still freezing. 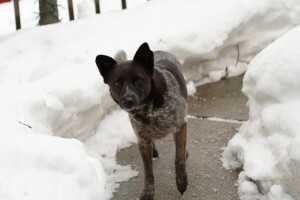 We were greeted by his mom’s dog Mimi upon our arrival, she didn’t seem to mind the cold. His mom was at work but all his siblings including his sisters, brother and his step dad were home keeping warm. 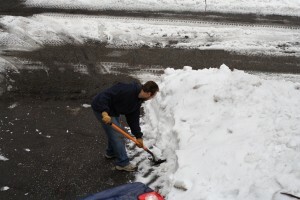 While we waited for his mom to come home, Bryan decided to help by shoveling the snow off the driveway and deck. 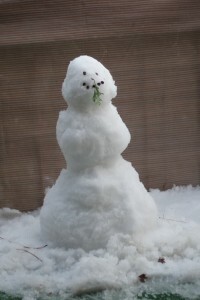 There was so much snow on the deck that Bryan made a little snowman. While Bryan was shoveling, his siblings and I sat by the fire and watched various Christmas movies. 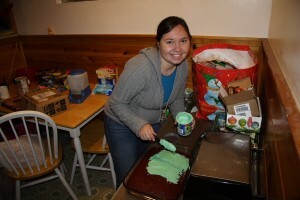 I also baked a red velvet cake for dessert. When Bryan’s mom came home from work we all ate a lovely dinner of spaghetti and let everybody open the presents that we brought up. After a long day we all went to bed anxiously awaiting Christmas morning. Bryan, his sisters and I stayed up late and watched Elf. I hadn’t seen that movie since my second date with Bryan five years ago and it was even funnier than I remembered. Personally I think it’s a Christmas classic, right up there with A Christmas Story, which we also watched and I didn’t enjoy. We finally went to bed but it was hard for me to sleep as it was so cold and I couldn’t seem to get warm. In the morning the kids opened all their presents and the living room was filled with wrapping paper and boxes. We sat around in our pajamas for a while partly because when we looked out the window it was raining pretty heavy and the wind was blowing fiercely. It was nice being inside next to a roaring fire, it was just like the song… “Oh the weather outside is frightful but the fire is so delightful, but since we’ve no place to go…let it snow, let it snow, let it snow!” But it wasn’t snowing, it was raining…hard. The trees looked like they would be blown over. We decided to leave before the weather got more frightful. The rain made the snow slushy and the roads into rivers. Once we got on the main highway to go down the mountain the fog was so dense we could hardly see a car length in front of us. We made it home safe though and will always have fond memories of our very own white Christmas.